One of my many interests includes doing computer animation one day (I’ve dabbled with it in the past but nothing good enough I can put on my blog yet). So naturally I pay close attention to children’s animated shows and one that really stands out in my mind is Pocoyo. Elly, the pink elephant on the show is one of the funniest characters to me and the shows creator’s did an awesome job of really accentuating her expressions and choreography for the win. If you too have an interest in doing your own animations and content and need some ideas or inspiration check out the show and how it uses camera angles, music and dynamic movements to make superbly entertaining scenes – even for adults interested in animation. LOL. When my daughter was younger she didn’t like these silly type shows very much but luckily she watched them enough for me to catch this one. Here is a link to a couple of minutes of Elly on youtube. The entire show does a great job with animation, so check out some of the other characters too if you’re interested. Obviously this show is designed for kids but some of the ideas will carry over to different type content. he wasn’t pleased; this wasn’t the droid he was looking for. As a matter of fact this was no droid at all – this was a malfunctioning iPod touch. Malfunctioning as in the very important home button had stopped working. I’ve had the device for nearly four years and used it practically every day and the home button stopped working over a year ago. It’s not a perfect workaround but check out this link from apple if you have the issue with yours and don’t want to fork out so much money to have it repaired. Sorry about the corny set up for today’s PSA but hey, Star Wars is fun. 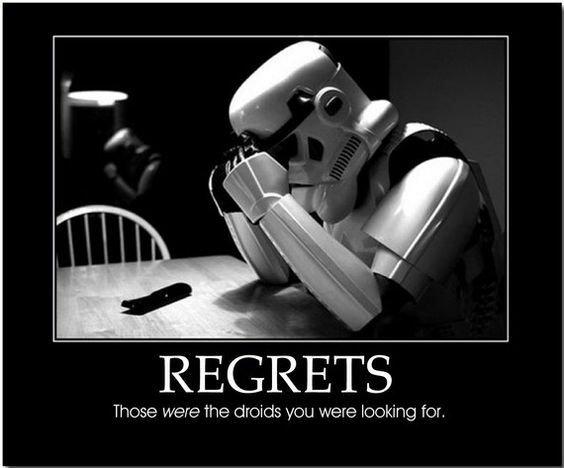 One final comment on the droid thing; you’ve probably saw the various inspirational posters out there – this link is a nice twist on that. Finally, on a different note, one of my favorite things to do is visit flea markets and yard sales. The Storm Trooper is on a creature called a dewback. I snagged them both for $5 which I thought was a good deal. I bought the hot wheels in the background from a nice Hispanic family at Sadie’s Flea Market in Dothan, AL along with a bag full of toys including an awesome giant pirate ship. I liked the following picture better than the one at the top but it didn’t make sense with my caption to have an R2 unit working with a storm trooper. LOL.